Clearasil is one of the best known names in acne care. A foaming, peach acne cream squeezed out of a tube, Clearasil was the most popular acne care product for tens of millions of Americans in the 1950’s, 1960’s, and 1970’s. In fact, for most Americans, it was the only acne care product for decades before other treatments reached the market. Clearasil acne pads make dry out your skin, creating even more problems. Clearasil produces inexpensive acne treatments, but are they really effective acne treatments? As is the case with many other product lines for getting rid of pimples, the most serious problem with pimple cream is that it uses too many skin care ingredients that sometimes cause stinging, burning, itching, peeling and new non-inflammatory skin blemishes. But Clearasil makes some inexpensive and effective creams and washes. Let’s look at the leading Clearasil products that work well, some that work well but don’t do what they are advertised to do, and a few that don’t work at all. Clearasil is one of the best known names in acne care. Clearasil products are inexpensive, and sometimes effective. If you don’t get stinging, burning, peeling, or itching after using benzoyl peroxide, the acne treatment cream is a great choice for killing bacteria in pimples. The new Clearasil product line includes acne cream that is not tinted in the familiar peach shade. Clearasil washes will cleanse your skin but they won’t clear up acne. Clearasil acne treatment pads may actually create new blemishes by drying your skin. The products in the acne treatment solution contain dangerously acidic skin peels that can and do burn sensitive skin. For just a little more, you can buy safe and effective acne care products from Exposed Skin Care. The most familiar Clearasil product for acne is also the best. This familiar peach-colored cream costs just US $6.29 for a 1 oz/28 gram tube, and the 10% benzoyl peroxide in the formula zaps the bacteria in infected pimples in just two days. The cream also doubles as a concealer, so if you happen to have peach-colored skin, you can hide the your bumps and pimples, although on some skin tones the peach tone of the concealer makes pimples more obvious, not less. This product can also soften sharp edges around acne scars, but there are other products that work better. DailyClear Tinted Acne Treatment Cream is a great spot treatment for pimples, but you should not apply it all over your face. The 10% concentration of benzoyl peroxide can and usually does cause irritation on the unblemished skin. Is peach not your color? This Clearasil product offers 10% benzoyl peroxide for killing acne bacteria fast, without the familiar peach tint. It’s great for killing acne bacteria fast, but like the tinted version of Clearasil, it can also cause itching, peeling, burning, and stinging if it is applied to unblemished skin. This product also retails for US $6.99 for 1 oz/28 grams. If you have both pimples and blackheads, this Clearasil product may be a good choice. It contains both benzoyl peroxide to kill the bacteria in pimples and glycolic acid to break up the “glue” that holds dead skin cells tight around blackheads. The claim made in advertising that it can get rid of pimples in four hours or less may be an overstatement, but you definitely should see changes in 24 hours. Don’t expect full resolution of blemishes in less than a week, however. Like the other popular Clearasil products, it is too strong to use all over your face. Here is a product that is advertised as “dermatologist tested and clinically tested to help visibly reduce redness and pimple size by morning to give visibly clearer skin.” While it certainly will get dirt, grease, makeup off your skin, the salicylic acid that reduces redness and pimple size get washed down the drain just a few seconds after you apply them to your face. This product will leave your skin cleaner but not clearer. Still, retailing for just US $8.99 for 6.78 fluid oz/204 ml, it is not a bad buy for a skin cleanser. It just won’t actually shrink pimples. Since the wash contains a botanical extract called helichrysum, avoid it if you have allergies of any kind. This product is Clearasil Ultra Overnight Wash minus the salicylic acid—which gets rinsed down the drain just a few seconds after you apply it to your skin. If you have sensitive skin, you wont have any problems with either Ultra Overnight Wash or Daily Clear Daily Face Wash for Sensitive Skin, but why not buy the latter, since it sells for just US $5.29? Both products will get your skin clean, but neither product will clear up blackheads or pimples. These pore cleansing pads are supposed to remove dirt and makeup with a small amount of sodium hydroxide, which is also known as lye. They are supposed to open pores with salicylic acid, and the pads include the right amount of salicylic acid to do the job. The problem is that the sodium hydroxide used to remove oil and makeup neutralizes the salicylic acid so that it can’t do its job. The pads also contain alcohol and menthol that can actually stimulate sebum production on sensitive skin. 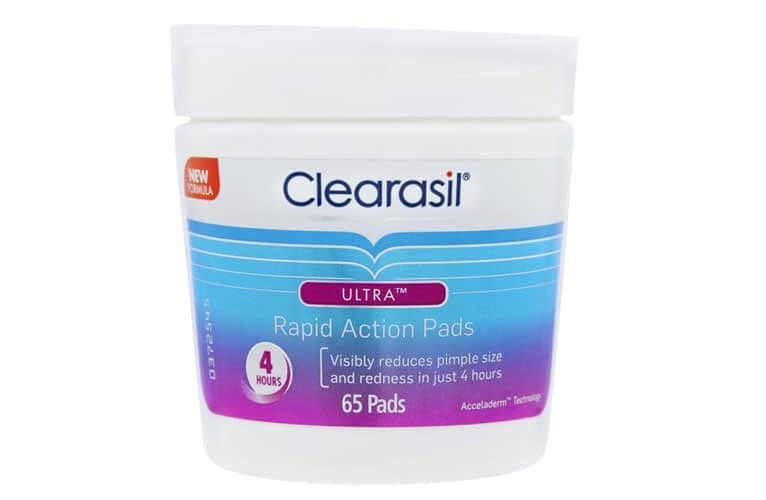 Even at the bargain price of US $5.49 for 90 pads, Clearasil Pore Cleansing Pads can’t be recommended. This daily face wash certainly has an attractive price, just US $4.99 for 6.5 fluid oz/195 ml. It is great for getting rid of makeup without the need for using cold cream. But it uses the same ingredients as bar soap that can make it too drying for anyone who does not have very oily skin, and it contains menthol and fragrances that can cause breakouts on sensitive skin. Even though the price is great, you probably will spend a lot more than you will save on concealer and skin restoration products if you use this product regularly. For just US $24.99 you can buy four Clearasil products in a single acne protection system. You get a bottle of StayClear Daily Face Wash (5 ounces/150 ml), a bottle of StayClear Daily Toner (5 ounces/150 ml), a bottle of StayClear Daily Lotion (1.5 ounces/45 ml), and a tube of quick-start benzoyl peroxide gel for disinfecting pimples. The gel is a proven disinfectant for pimples. But the other products in this acne care system have serious problems. The face wash contains 2% salicylic acid for loosening dead skin around blackheads, but you rinse this skin-active ingredient down the drain almost as soon as you put the product on your face. The lotion also contains menthol, which can increase oil production on some types of skin. The daily toner also contains salicylic acid, but at a pH (2.3) – low enough actually to burn the skin. Even worse, the toner contains a large amount of isopropyl alcohol, which can dry out the skin. And the toner is also mostly alcohol. For just a little more, you can find an acne treatment system that offers the ingredients you need without the ingredients that may harm your skin, Exposed Skin Care. Does anyone know why Clearasil stopped making the tinted Clearasil in the larger 28g tube? it's only available in the 18g size tube , this make the product much more expensive to buy . IT STINKS! IT BURNS MY SKIN LIKE CRAZY! I DO NOT RECOMMEND THIS PRODUCT!